Losing stuff is a great reminder of why you had it in the first place — how you use it, and why it’s important to you. When it’s gone, you can react one of two ways: get discouraged about everything it served for you (and maybe angry, depressed, or inert for a day); or attack it with a new gusto, a near-vengeance even, moving on. Especially if what was lost is replaceable or substitutable in some way, the second option is much the wiser if you can muster it to some degree, in due time. So when this happened (and yeah, make sure your fire escape-facing windows are really secured, New Yorkers), I tried to shake it off as best as I could. Once the report was filed, fingerprints were taken, I went back to the kitchen, where my laptop and camera had both last been seen. I made this salad. It was so refreshing, easy, and delightful to look at. So I decided to share it, just as always, but with so much more urgency this time. Oh wait, the camera part: so my camera that was stolen had newly taken photos in it that I’d meant to use for a new recipe post. I didn’t think that the dish turned out too incredibly (it was an artichoke dish), but I had it in the wings, waiting to post any day now. That’s no longer an option. But what the robbers didn’t know is that the camera they took was a discontinued, virtually worthless, should-have-been-retired-by-me Canon Powershot and tucked into the closet was a new(-er), more expensive, Canon SLR model that I used only sparingly, due to laziness and familiarity with the old model. Nothing like a robbery to set you straight. So armed with this good camera and old, crusty laptop, I cooked up the dish that you’re seeing now. And, I liked it so much. Much better than the artichoke thing, whose photographs are lost in the ethers of pawn shops or just wiped out entirely now. The other thing about this new(-er) camera is that I’d bought it from Ganda when she was moving a couple months ago. Ganda is the blogger who basically inspired me to start a food blog back in 2006. 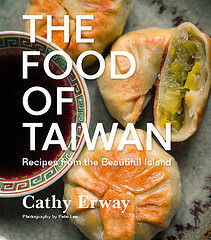 And she left the camera filled with beautiful photos of food! Just food! How cool is that? Of course, I don’t expect this story to come full circle; my laptop’s still gone along with all my files of writing in it. I don’t expect whoever snatched it to enjoy reading them or looking at my food photos. But if he or she did, they might know that that’s what I’m all about. And that’s what I’m going to keep doing, more than ever, right here and now. 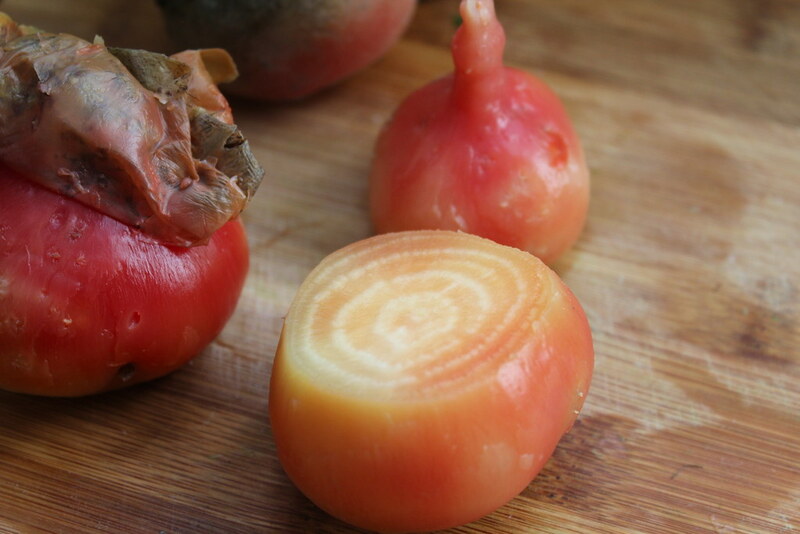 Boil or roast beets until tender. Let cool until cool enough to handle. Slip off the skins and trim the ends. Slice into about 1/4″ thick discs. Toss with most of the lemon juice and olive oil along with a couple pinches of the salt. Let sit to soak up the flavors preferably at least 15 minutes before serving (or up to overnight). Trim the rind from the melon and scoop out the seeds. Cut into thin sections roughly equal size to the beet slices. Toss separately with a squeeze of the lemon juice (do not toss along with the beets or their color will stain). 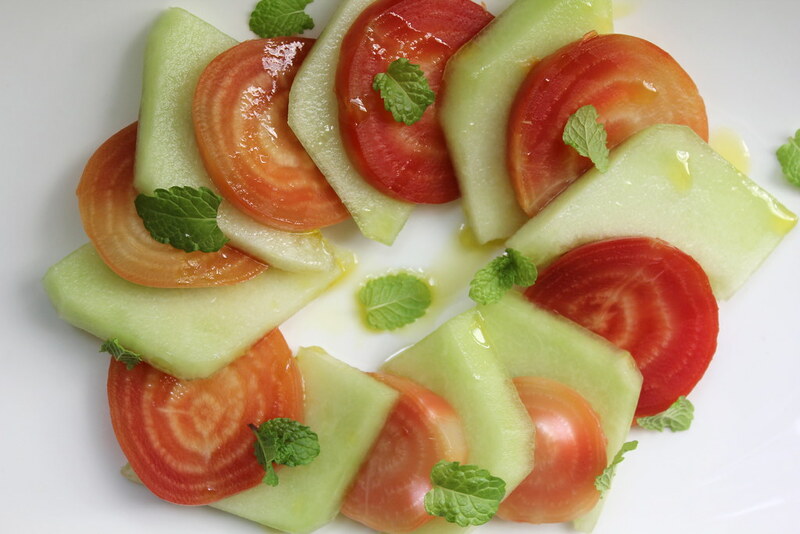 Arrange the beet slices and melon slices alternating on a serving dish. 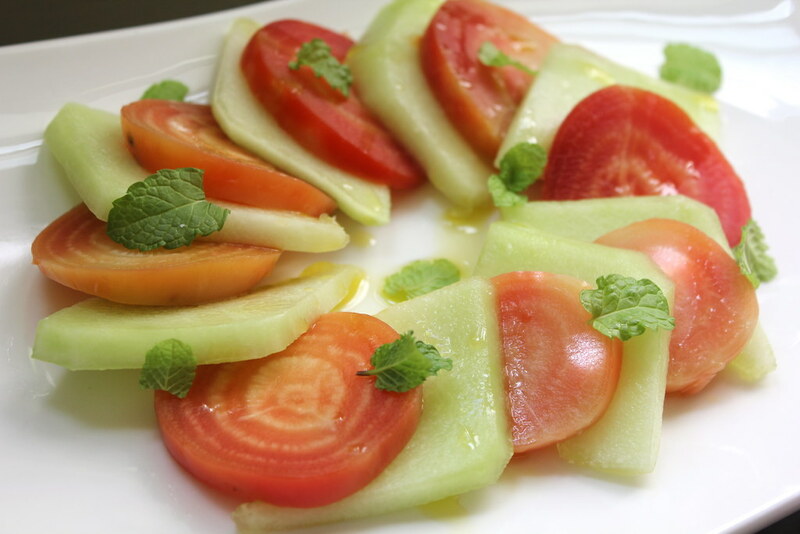 Finish with an extra drizzle of the olive oil and sprinkle of salt, and garnish with the fresh mint leaves. 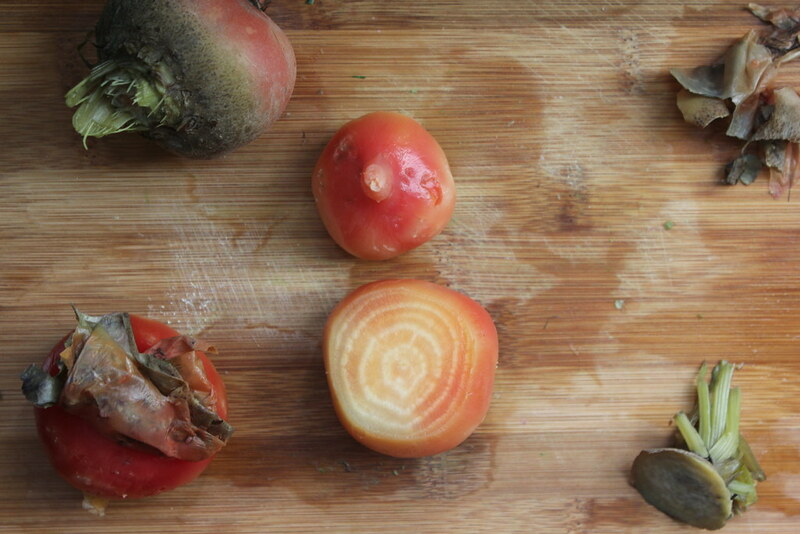 Four brownie points: Beets pack a lot of phytonutrients for a salad. I don’t like how they can be used so sparingly in salads where they’re tossed with greens — I want to eat a lot of beets when I get them, and all the better for my antioxidants. 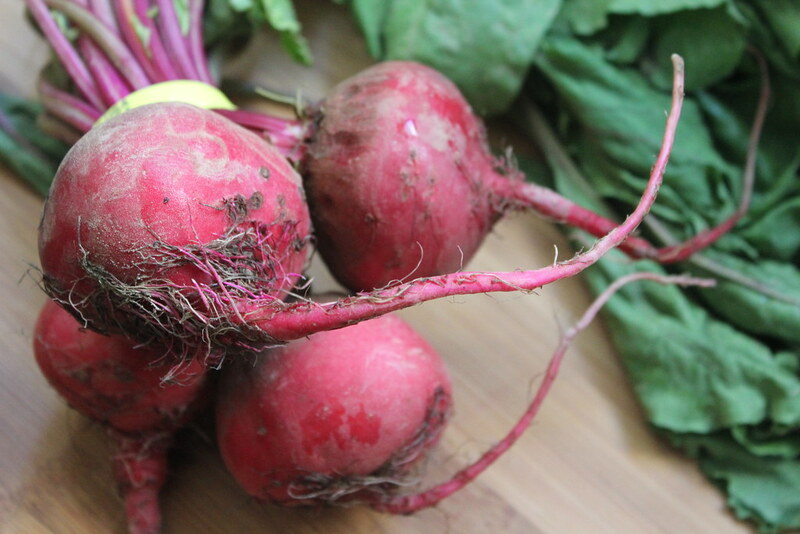 Because beets are naturally high in sodium, it’s best to use fresh rather than canned beets (and I think they taste much better fresh anyway). The melons provide a sweet, cooling contrast as well as more Vitamin C and potassium. 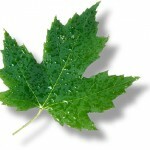 Nine maple leaves: Beets and cantaloupes are both in season now — who’d have thunk? One seems more oriented towards winter, and one is definitely a symbol of the summer, but they’ve both come in recently through my CSA, and can be found in farmers markets during this late-summer season. Just wanted to drop a note to let you know that I check this blog religiously and use it for so many recipe ideas. I read your book last spring and it inspired me. I’m a band director in the public schools in Louisville, but I’m also a foodie and obsessed with the local, fresh, organic, etc scene. I really enjoy your posts and your recipes. Just thought I’d let you know. And sorry about your loss. The melon and beet salad looks great. Wow! Nothing like a burgulary to set you straight and destroy your confidence in others! After I was burgularized it took what seemed like years to gain a feeling of security back. Cathy! I’m so sorry to hear about the burglary! That is really scary. It seems though that it really lit a fire in you that I know will result in awesomeness and looking forward to more DSLR shots from you – love that one of the cut beet. I love Ganda’s blog too, was obsessed with her You Are What You Eat series! Aw, thanks everyone! See, now there’s even more silver linings to this cloud. Much appreciated!